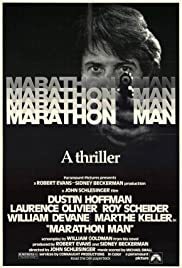 BEFORE: I’m recovering quite well from my wisdom teeth removal so it’s time to watch the second dentistry-related film, Marathon Man. And then time to rest and prepare for a midnight showing of The Dark Knight Rises. AFTER: I thought this was an interesting concept, just poorly executed. The premise of the film is that there is an ex-Nazi (Lawrence Olivier) who is trying to recover diamonds he stole from Jews in concentration camps and Doc (Roy Scheider) and his brother Babe (Dustin Hoffman) get involved in this mess. But instead of action and intrigue, this film is filled with boring reaction shots and uninteresting dialogue. A good chunk of the film is following Babe run around New York City. In the beginning it’s to show he’s preparing for a marathon, at the end it’s to escape the bad guys. But in both situations there’s a lack of excitement. I don’t get a heart-pumping, adrenaline-filled sense in these action scenes as I do in other movies. So while I feel all the necessary elements for a good film are here, the assembly and execution by the director John Schlesinger could be much better.